Essential Rampaging Hulk Vol. 1, published by Marvel Publishing, Inc., 584 pages, $16.99. Recently, while lucky enough to be enjoying Tulsa’s first DefCon comics convention in over a decade, I became luckier still. I stumbled upon Marvel’s Essential Rampaging-Hulk Vol. 1. 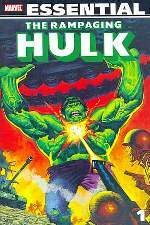 Reprinting material from Rampaging Hulk, #’s 1-9, and The Hulk, #’s 10-15, both originally produced in magazine form, this tome is nearly 600 pages of some of the best comics work done in the ‘70's. The Rampaging stories feed an ongoing feature in which the Hulk, his “sidekick”, Rick Jones and an alien woman named Bereet contend with extraterrestrials intent on subjugating Earth. While there’s not much deep character development, writer Doug Moench keeps the action and intrigue snappy and satisfying. His stories from The Hulk are a bit different, but interesting as they have the “feel” of the Hulk t.v. show of the same era, which was intentional on Marvel’s part. Most impressive, however, is the art contained in this massive volume. Normally, I don’t care for art team changes in each successive issue of a series. It works for the Rampaging stories, however, due largely to the high level of inking talent. Pencilers Walt Simonson, Jim Starlin, Sal Buscema and Keith Pollard are naught to be sneezed at, but with the likes of Alfredo Alcala, Alex Nino, Tony Dezuniga, Jim Mooney and Rudy Mesina embellishing their work, a true comics art fan can’t go wrong. Even Herb Trimpe’s work, which I’ve never warmed to, is to be admired with Alcala’s finishing touches. The reprints of The Hulk are a little more uniform in appearance, even though the work of sole pencil artist Ron Wilson also enjoys an assist from none other than Ricardo Villamonte, Ernie Chan, Bob McLeod and others. Many of these Hulk stories carry the mood of the old monster and scifi movies and pulps. This Essential volume is highly recommended for fans of such fare, as well as all Hulk fans and comic art afficionados.